In the end, the car that could speed down the track at a frantic pace was left idle on the side of the road, its tires slashed and battery disconnected, with no time left to catch up. When New Orleans started their drive inside Eagles territory, dark ominous clouds had already begun to form over the Linc, a sign of what was to come. And as the Saints got one first down, then two, then three, leading to what would eventually be a chip shot field goal to win the game 26-24, they were astute enough to bleed every remaining second off of the game clock to ensure that the Eagles would have no time to counter. And with that, one of the more fascinating and entertaining Eagles seasons in recent history came to an end, as the Saints came marching in and will go marching on to face the Seahawks this weekend, instead of the Eagles facing the Carolina Panthers on Sunday. Almost four months ago to the day, my father and I sat in what was a gorgeous Sept. night at FedEx Field watching Chip Kelly stand at midfield perceptively eyeing the Redskins practice before their Monday night opener with the Birds, as if through osmosis, he could figure out what they were doing. 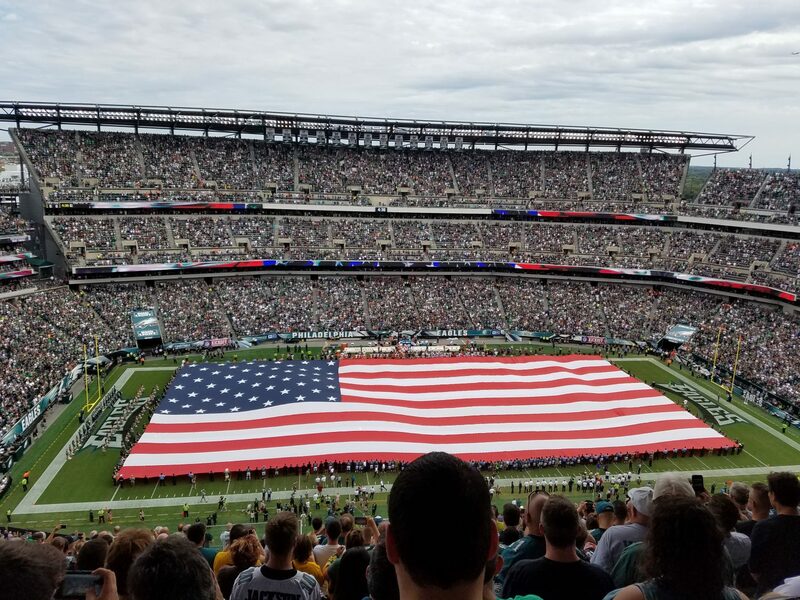 And I never recall, in my many years as an Eagles fan, the anticipation that I felt that night before kickoff, if only for the fact that there was a sense of newness not having been felt in these parts for….well, about fourteen years. And though Kelly and his Eagles started off slow, they did not disappoint, going 7-1 in the 2nd half of the season en route to a 10-6 record and their 1st NFC East title and playoff berth in three years. In the preseason, Chip Kelly was still a novelty, but there was still the chance that he could fail miserably faster than a dot.com company after the turn of the century. Instead, Kelly grew into a bona-fide NFL coach, and with him, a young quarterback named Nick Foles came of age as well. But while the offense seems to be as potent as advertised, there is still work to be done. The defense, while somewhat of a pleasant surprise, is not Superbowl caliber by any means, and a new safety, along with a stud on the defensive line who can wreck havoc on a quarterback, would be #1 on my draft/free agency wish list. And oh yeah… a kicker with ice in his veins a la Adam Vinatieri would probably not be a bad stocking stuffer either. Saints at Seahawks 4:35 PM FOX – The Saints continue their scenic route through the playoffs, moving from the Liberty Bell and Independence Hall to the Space Needle and the Pike Place Fish Market. Seattle is trying to get to the Super Bowl for the 2nd time in its history, and the 1st time since the 2005 season. And with the #1 seed in the NFC and the “12th man” in the form of their fans, they have as good a chance as ever. Colts at Patriots 8:15 PM CBS – Another cold winter and another playoff season of watching Bill Belichick on the sidelines looking like the emperor from Star Wars in his Patriots hoodie. And while Brady may be the old school veteran, there’s a new “jedi” in town in the form of Colts QB Andrew Luck (though he looks like a character from “Planet of the Apes” with that awful looking beard). 49ers at Panthers 1:05 PM FOX – The Niners played a tough defensive minded game against Carolina at home in Week 1o, losing 10-9 (when was the last time you saw an NFL score so low?). This time, the stakes are much higher, and the Panthers will be pumped at home and come out victorious. Sorry…I know that the Niners fans in the family don’t want to hear that…. Chargers at Broncos 4:40 PM CBS – “As Broad & Pattison Turns” reader Sean Z. reminded me that the team that the Eagles played in their home opener the last four seasons has gone on to win the Superbowl that year (Saints, Packers, Giants, & Ravens in chronological order). Well, don’t look now, but the 2013 Eagles home opener opponent, the San Diego “Superchargers”, are still alive and well in this year’s playoffs. The Last Word – RIP Shashi Maushi…a big Eagles fan and an all around great lady. Your warm personality and nature will be greatly missed.